What makes it special? 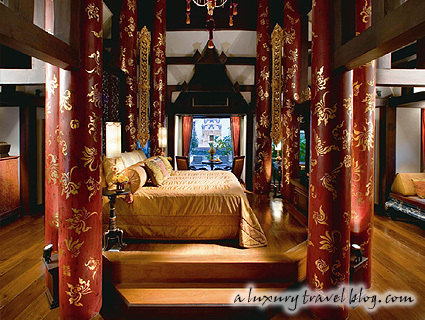 Unique design which inspired by a mix of northern Thai palace and Royal Lanna architecture with six private pavilions featuring three king size beds and three twin bedrooms, three swimming pools, as well as a number of sitting and dining rooms, open-air salas (Thai Pavilion) and even a lounge with a grand piano and bar. A stay in the Royal Residence is the ultimate experience offering guests a vast, private retreat compound at the heart of the resort. Situated behind high walls, the Royal Residence is completely self-contained with six private Lanna-style pavilions featuring three king size beds and three twin bedrooms, as well a number of sitting and dining rooms, open-air salas and even a lounge with a grand piano and bar. The Royal Residence is the ideal choice for discerning travelers, celebrities and visiting royalty who wish to preserve their privacy while they indulge in style. It is also perfect for groups of friends traveling together or extended families. In addition to its individual sleeping pavilions, the residence boasts three luxurious swimming pools, private Jacuzzis and saunas, all set right on the edge of the compound’s own free-form lotus pond between a number of towering Rain Trees and fragrant Frangipanis. The design of the Royal Residence was inspired by the mythical Himmaphan Forest of Buddhist legend, a heavenly realm of lush flowers and foliage inhabited by celestial beings and otherworldly animals. Each of the residence’s elegant teak pavilions is intricately crafted, showcasing the woodcarving traditions that northern Thailand is famous for. Interiors and exteriors are decorated with apsaras, elephants, Kinnarees, exotic birds, fish and flowers carved in wood and plaster throughout. 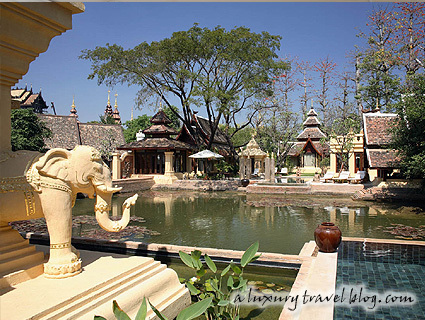 Brick walkways connect each unit through their poolside gardens and an enormous wall of life-size elephant sculptures drawn from Chiang Mai’s oldest temple, Wat Chiang Man, provides a dramatic focal point for the entire complex. Each pavilion is unique in style and design, inspired by a mix of northern Thai palace and Royal Lanna architecture. Color schemes vary from one pavilion to the next, ranging from rich red and gold to cream and pink to black and silver. High ceilings and handcrafted details abound while sumptuous silks, plush furnishings, and a selection of rare antiques contribute to the residence’s atmosphere of lavish luxury. A large dining room with floor to ceiling windows and pantry allow guests to entertain family and friends in the unique setting of their own ancient Lanna palace. wow fit for a king! very luxurious. 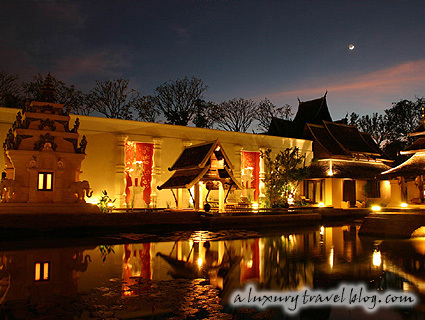 Mandarin Oriental Dhara Dhevi, Chiang Mai is still the “it” hotel/resort in the world. I’ll be satisfied if I could just check in the standard room or villa.